Last year I had the pleasure of joining two friends (Oliver and Dave) at Oliver’s camp located North of Algonquin Park. 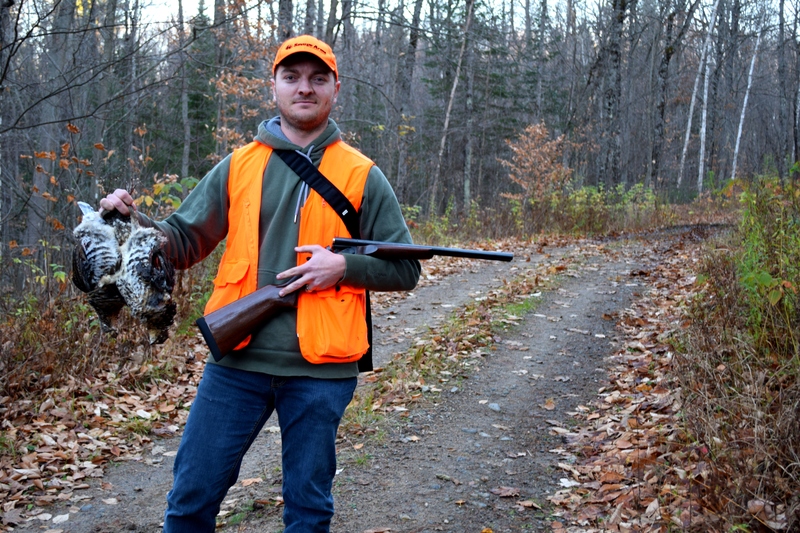 One week after Deer season, we travelled to the camp in search of one of Ontario’s most notorious game bird, the ruffed grouse. (https://wildsofontario.wordpress.com/wp-admin/post.php). This trip was, an astounding success and I was overjoyed when rumours of a second trip in 2014 started to swirl. This year, the trip was planned for late October to take advantage of the fall colours and to fit the trip into our busy schedules. Oliver had reported that they had seen an over abundance of birds just a couple weeks earlier on a separate trip. Including a single, rare for the area, spruce grouse. The intent of the trip was to install some much needed insulation at the camp , but mostly we were just hoping to get into some heavy bird action. 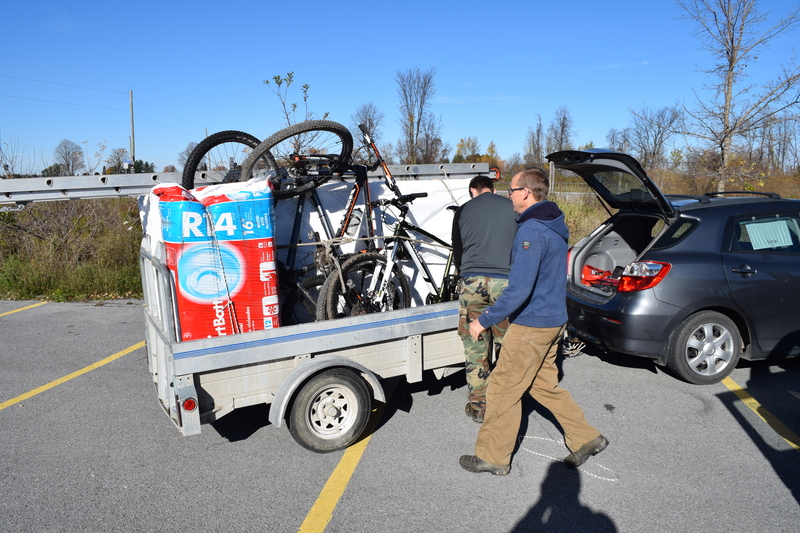 Dave and I loaded our mountain bikes, hunting gear and some renovation supplies into a trailer and made our way up to our meet point in Arnprior. Once there we piled into Oliver’s larger vehicle, switched the trailer over and barrelled down Highway 17 with visions of grouse in our heads. It was good to reunite, share some laughs and reminisce on past trips on the way to the camp. Once arrived, we settled in, unpacked the shotguns, and immediately headed out into the bush. 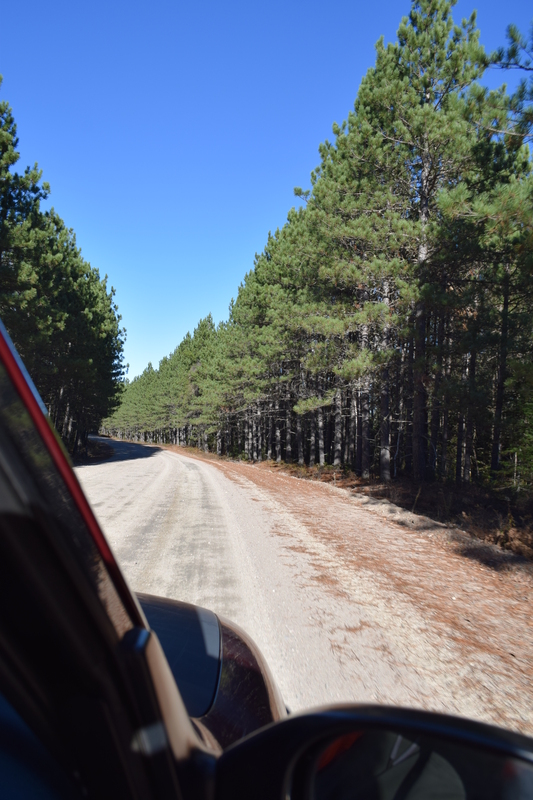 Our arrival at the camp was greeted by a warm sunny fall day with not a cloud in site. This was perfect grouse hunting weather. 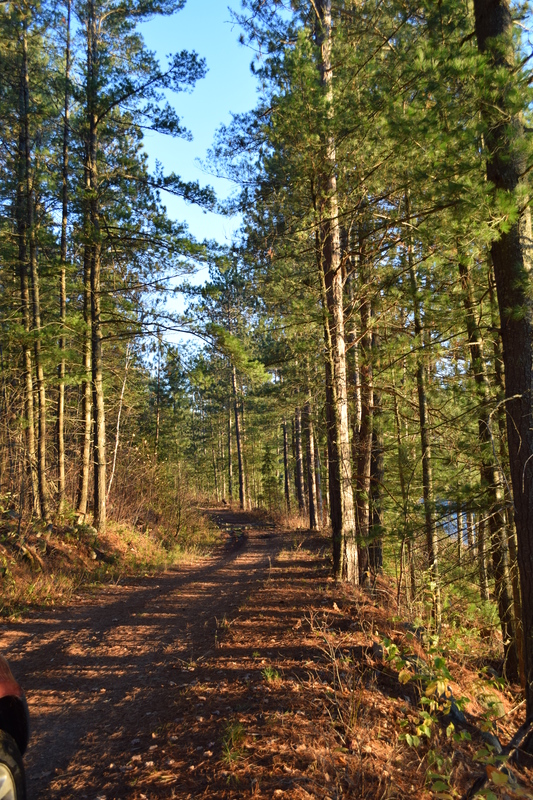 Since the camp was strategically located near several old ATV trails, we decided to start out hunt there. These trails were surrounded by thick mixed bush with lots of undergrowth and some slash from former logging operations. Grouse often congregate on trails where they can pick up small stones to aid their digestion process. These places can also act as centres for social gathering or mating. Coupled with the protection the nearby thick brush provides, and proximity to running water, these areas are absolutely ideal for ruffed grouse and many other “Tetraonine” species. Not long into our outing the grouse started to appear and we managed to harvest several birds. The trip was off to a great start! 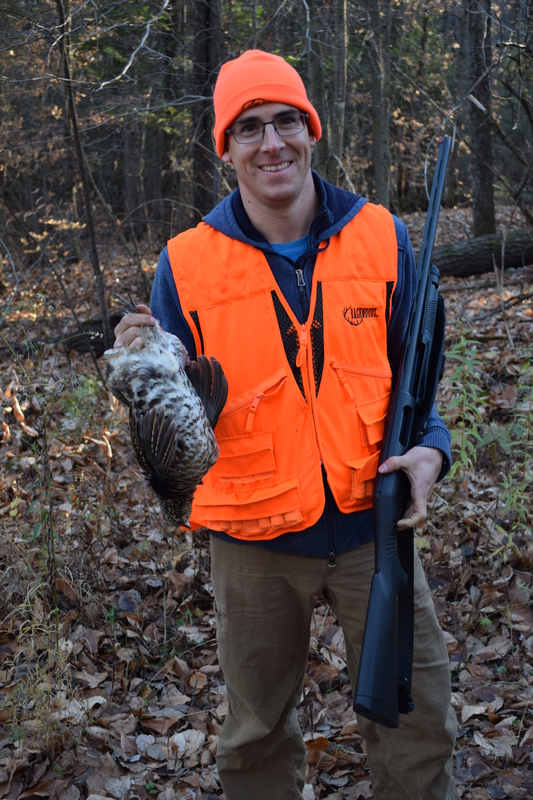 As you can see in the photo below, the gun was very efficient at taking down grouse and was capable of making consistent shots up to 40 yards. 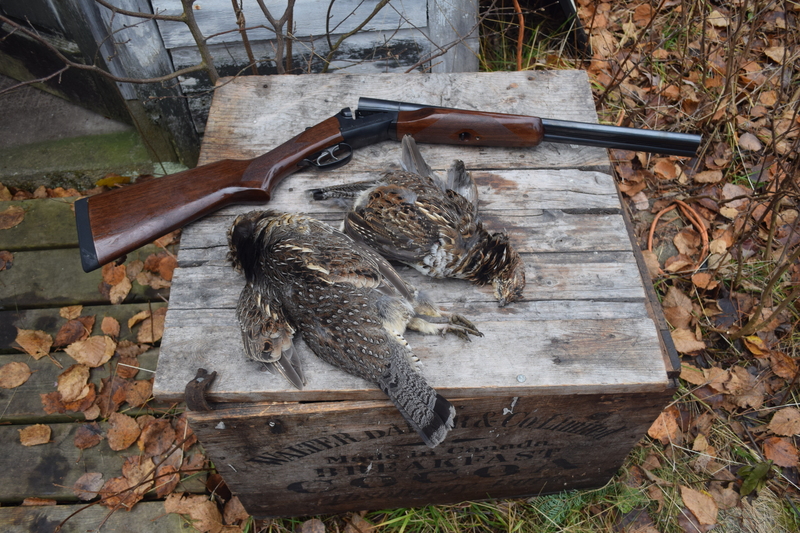 With the short barrel and bead sight this little gun was faster than any other grouse gun I have ever used. Being a 20ga with a short barrel makes this gun very light on the arm. In turn making it easy to carry in hand for long periods of time. Most people immediately have an issue with the short barrel, but don’t let that dissuade you from considering this little beauty. Instead focus on its good points: low cost for a break action ($549), fast barrel, sturdy build, sleek demeanor, light weight, the short barrel makes it fast in the bush, and it comes with interchangeable chokes (which is rare for double barrels). Not to mention there is something elegant about a SxS compared to the brash functionality of a pump. I’ll have to remember my blaze orange top hat and monocle for the next hunt! Back to the report, when the dust and gunpowder settled, each of us had multiple shooting chances, and in total we harvested 8. We spotted at least 6 more birds and a woodcock but unfortunately we were not given great shots and the birds were able to disappear in the underbrush. Regardless, for two days of only sporadic hunting between renovations, we walked away with a great group of birds that more than doubled our success last year. Unfortunately a local martin (or similar critter) decided we had one too many birds and helped itself to one leaving us with 7. Harvesting these birds is a lot of fun. Not to mention, many claim they are the best tasting and most prized game bird of all the north American species (myself included) . But it is not just the end result that drives me to trek the dirt paths for these birds year over year. 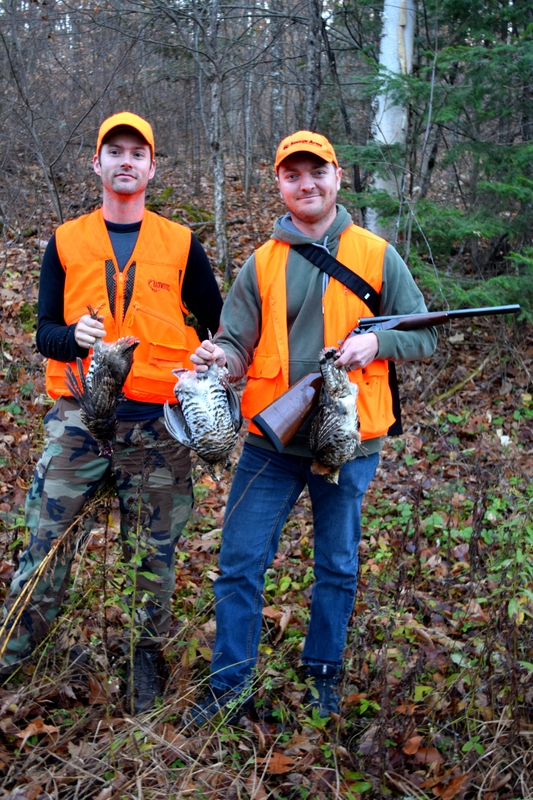 Grouse hunting offers the hunter a chance to see nature at its best. Beautiful sunrises, pristine lakes, the majesty of the creatures you encounter while you walk and the over all sense of being part of something larger than yourself. Its a great past time to share with friends and family alike and guaranteed to provide you with memories for the future. 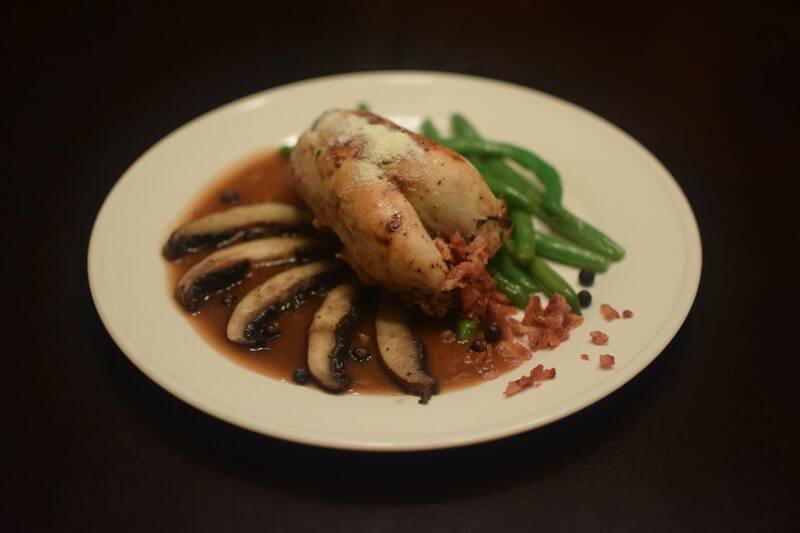 Once back I decided to pull out all the stops and create a nice dinner for the Mrs. Mmmmm nothing beats grouse!